INSTITUTE FOR THE FIELD LIMITS OF SCIENCE (IGW) - INNSBRUCK; CENTER FOR STUDY AND RESEARCH ON PSYCHOPHYSIOLOGY OF STATES OF CONSCIOUSNESS - MILANO; EUROPEAN SCHOOL OF HYPNOTIC PSYCHOTHERAPY AMISI OF MILAN; PARAPSYCHOLOGY CENTER OF BOLOGNA. 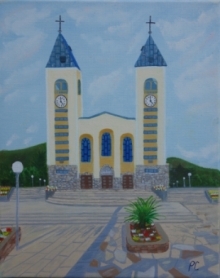 At the request of the Parish Office of Medjugorje psychophysiological and psychodiagnostic research was carried out on the subjects who since 1981 are known as the visionaries' group of Medjugorje. The research was carried out in four sessions: The first research was carried out on April 22-23, 1998 at the Casa Incontri Cristiani [House of Christian Encounters ] in Capiago Intimiano (Como), which is operated by the Dehonian Fathers. On this occasion the examined were: Ivan Dragicevic, Marija Pavlovic Lunetti, and Vicka Ivankovic. The second research was carried out from on July 23-24, 1998 in Medjugorje. Examined were Mirjana Soldo-Dragicevic, Vicka Ivankovic and Ivanka Elez-Ivankovic. The third research, only psychodiagnostic, was conducted by psychologist Lori Bradvica on Jakov Colo with the collaboration of Fr. Ivan Landeka. The fourth psycho-physiological registration was conducted Dec. 11, 1998 in the same House of Christian Encounters in Capiago Intimiano (Como) with Marija Pavlovic. The incompleteness of the psycho-physiological investigation was caused by the partial cooperation of some subjects who did not undergo what the working group had expected, due either to their family or social obligations or to their personal reluctance, even though Fr. Slavko Barbaric and Fr. Ivan Landeka encouraged them to do it, without any influences on the programs of the working group called "Medjugorje 3", because, apart from individual medical or psychological investigation, prior to this research two groups had operated: the first a group of French doctors in 1984, and the second a group of Italian doctors in 1985. In addition three European psychiatrists in 1986 carried out only psychiatro-diagnostic investigations. -Fr. Andreas Resch, theologian and psychologist from Institute for the Field Limits of Science (IGW) - Innsbruck; General coordinator. -Dr. Giorgio Gagliardi, medical psychophysiologist from the Center for Study and Research on Psychophysiology of States of Consciousness - Milano; member of board of European School of Hypnotic Psychotherapy AMISI, Milan and of the Parapsychology Center of Bologna. -Dr. Marianna Bolko, psychiatrist and psychoanalyst, instructor for specialization in psychotherapy at the University of Bologna. -Dr. Virginio Nava, psychiatrist; head doctor at Como Psychiatric Hospital. -Dr. Rosanna Constantini, psychologist, instructor at Auxilium University, Rome. -Dr. Fabio Alberghina, medical internist. -Dr. Giovanni Li Rosi, gynecologist at Varese Hospital and specialist for hypnotic psychotherapy, AMISI, Milan. -Dr. Gaetano Perriconi, internist at FBF Hospital in Erbi/Como. -Prof.. Massimo Pagani, medical internist, professor of internal medicine at the University of Milan. -Fiorella Gagliardi, secretary, community assistant. -computerized polygraph (skin electrical activity; peripheral cardiac capillary and heartbeat activities; skeletal and diaphragmatic pneumography) during the apparitional experience, during mediated hypnotic recall of the same apparitional experience. -Holter's arterial pressure dynamic registration. -Holter's electro-cardiographic /respiratory dynamic registration. -altered state of consciousness (defined as the ecstasy of apparition). Results of the investigation carried out demonstrate that the ecstatic phenomenology can be compared to the one from 1985 with somewhat less intensity.The hypnotically induced state of ecstasy did not cause the phenomenology of spontaneous experiences and therefore it can be deduced that the ecstatic states of spontaneous apparitions were not states of hypnotic trance. (Undersigned) Fr. Andreas Resch, Dr. Giorgio Gagliardi, Dr. Marco Margnelli, Dr. Marianna Bolko, Dr. Gabriella Raffaelli.